Its so wonderful to see the difference adaptive technology makes in peoples lives. She turned to the Optelec ClearView+ desktop video magnifier – a new product at the time. She now has one for work and one for use at home. 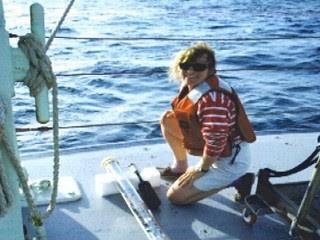 “My work involves reading, analyzing graphics and publishing in professional journals,” says Bower, who is now tenured and is the senior female scientist in physical oceanography, a field concerned with the ocean’s role in climate as well as the physics of ocean currents. Her work also includes travel for weeks at a time to places like the Indian Ocean, Mediterranean Sea and the North Atlantic. Thank you for your demonstration of the value of the Optelec machine for Dad. On Saturday he read Golf World when it came in the mail-he was able to read this magazine for the first time in 3-4 months. It’s already making a difference for him. I love my new machine and enjoy using it very much. It was so wonderful meeting you and sharing our faith. My dad loves his new machine! I think it’s going to make a definite improvement in his life. Thank you so much! Thanks for all help. Margot loves the ClearView +. Mom is doing quite well with the video magnifier and is delighted to write a grocery list, sign a document and look at her mail. She has adapted quite well to writing –reading has been a bit slower, but she’s making good progress and is just delighted. Thank you for your assistance-it is much appreciated. I am very appreciative to you as the Optelec ClearView + HD 24 has made a big difference in my life. Because of the equipment that I purchased from you, my life is productive. Your equipment has allowed me to stay independent and I’m so thankful that I can continue to run my business! Your presentation of visual aids which enrich the lives of people with low vision is very impressive and much appreciated. The ClearView C Speech is a wonderful example of combined sight and sound, but reading and storing documents is beyond belief. You amazed us!!! Many thanks! The new Optelec ClearView C Speech is great! Thanks so much. Thank you for the in-person delivery and instruction of the Optelec Video Magnifier. It is a pleasure to know you and work with you. You made my Dad’s day! He is ever so excited as this piece of equipment will OPEN up his world again and he can read articles when before he could only read the headlines! Dad is using his new video magnifier all the time and thinks it’s great. Thank you for your attention. I have been enjoying being able to read again! I am using the new Optelec ClearView + Speech constantly to catch up with my paperwork! I was able to write this note with my wonderful Optelec Clearview + Speech machine. I love my Optelec CV+ machine. I feel like I am back in charge of my life! The Optelec Clearview+ has opened up a new Verizon for Leo and myself. We also want to thank you for your kindness. What a wonderful job to be able to change people’s lives in this wondrous way. We are grateful. The Video Magnifier has been my lifeline.I recently sold my house of 15 years and moved to a one room senior residence. I made sure that the video magnifier could fit in! Thank you for being so nice about answering my questions. Thanks for your help! The new ClearView+ Speech is a fine improvement. I want to convey my deep appreciation to you. My son is reading for the first time in three years. I am using the device myself and find it so good not to depend on someone to read for you. I can finally read the newspaper Thank you so very much from me and my entire family. I am really enjoying my Video Magnifier–baking brownies and banana breads and reading the instructions myself My six year old grandson is excited that he can do his vocabulary words with me on my CCTV. Thanks to my Personal Reader I have read my first newspaper in two years, helped my son with his final exams, reading a book and writing this note! I know it’s your business to market the visual aid machines, but I want to acknowledge your personal approach. Your care and consideration in getting things set up for me was much appreciated. I’m finding many ways to make use of the Video Magnifier’s possibilities. Thank you for bringing so much joy back into my parents lives. It’s heartbreaking to see your loved ones start to fail in so many ways. The Video Magnifier has given them back their vision. My father says he has a whole new outlook. As you saw, he was skeptical at first, but after using the unit-he is thrilled! I also want to thank you for not just being a salesman selling a product, but for being a person who spent time talking with my parents-they really enjoyed that.